Overly enthusiastic newcomers to technical analysis (and some old-timers who should know better) sometimes believe they have found a leading indicator. This is never true. All indicators are based on past price movement, so logically, no indicator can point to the future with any degree of reliability. Indicators and certain bar configurations may strongly suggest the next price move, especially when they appear together and offer some confirmation, but it is always possible that some piece of news will come out and totally trash the indicated price move. We have all seen cases where three or four “leading” indicators all point in the same direction, and yet the expected price move does not materialize. Indicators only indicate, they do not dictate, and it is a sad fact that we do not have reliability statistics on indicators. If you want to compute a reliability quotient for your indicators, you have to do it yourself. Bottom line: so-called leading indicators are very often wrong. Welles Wilder noted that a change in momentum is often (but not always) a precursor to a change in direction. The model is for momentum to start modestly, accelerate rapidly as the bandwagon forms, peak when nearly all the buyers or sellers have taken positions, and then tail off, whereupon the earliest of the early birds begin to take profit and that sets off a move in the other direction. You can use plain old momentum or rate-of-change to identify the stages of momentum. The chart below is showing momentum, calculated as the close today divided by the close 12 periods ago. We see momentum falling as the price falls, but then momentum stops falling and starts to rise. We get one more lower spike low, but it is a dragonfly doji, which we interpret as bullish. Sure enough, momentum was a good leading indicator and the price proceeds upward. After the small move up, momentum peaks on exactly the same day as the price peaks and then falls alongside the price. Here it is a coincident indicator. 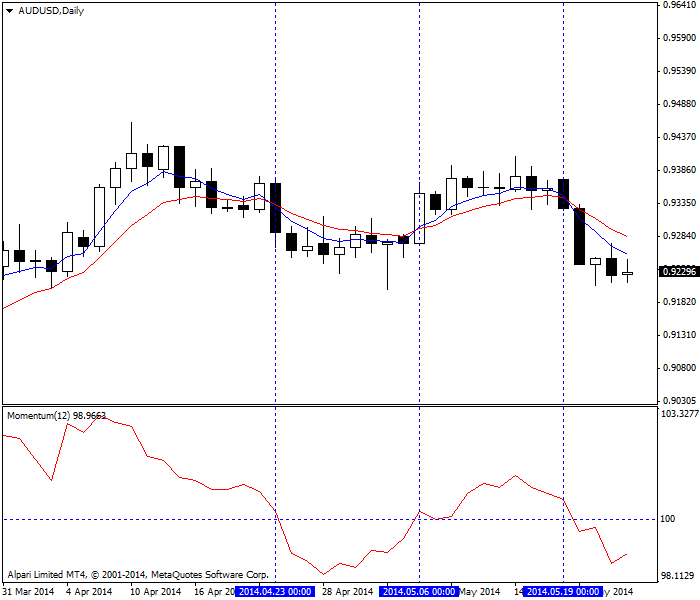 Momentum indicator leads then coincides. 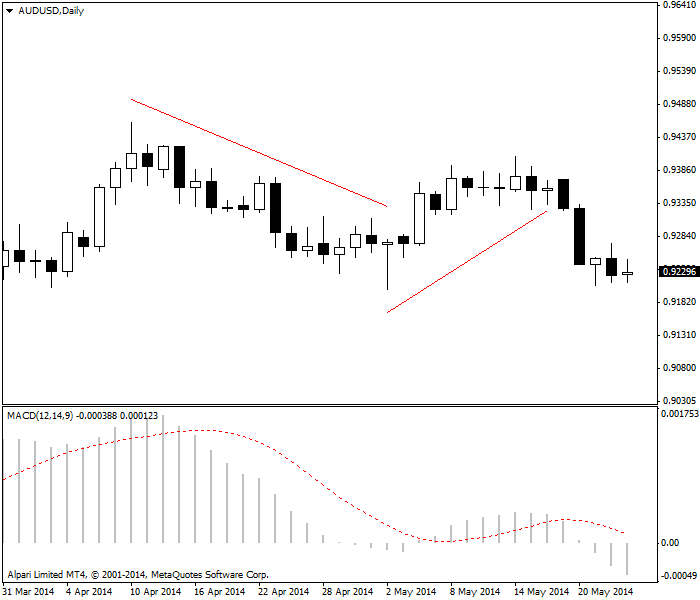 ADX, measures the strength of a trend and thus the degree of bullishness or bearishness. Another leading indicator is average true range or ATR. Again, market psychology offers the explanation. The range will tend to expand as a higher number of traders do battle over the direction during the period. If bulls win, the close is at or near the high, but the presence of bears is seen by the low fairly far away at the wide end of the average range. When uncertainty rears its head, as occurs near the end of a rally or a rout, the range will contract as fewer traders have a conviction about direction. This is the main reason Wilder used the ATR in calculating the ADX. The next chart is the same one as the previous but with ATR added. The horizontal blue line marks where ATR stops falling and is flat, and it even rises a little, but it does not get really sizeable. After the flat region, ATR falls again, telling you that the mini-rally identified by rising momentum is a flash-in-the-pan and not to be trusted. A real rally would have rising ATR. Fading ATR suggests a fading trend. Relative strength index is another momentum-based leading indicator. See the next chart. As with the ATR, we get a horizontal region that indicates momentum has stopped contracting, but the rise that comes afterward is weak and not long-lasting. The stochastic oscillator is probably used by more traders than any other indicator to use momentum as a leading indicator. As you can see on the next image, the stochastic gives a false buy signal (red box) that is quickly reversed before giving the true buy signal a few periods later. Note that the true buy signal comes about 5 days earlier than the buy signal using raw momentum alone. 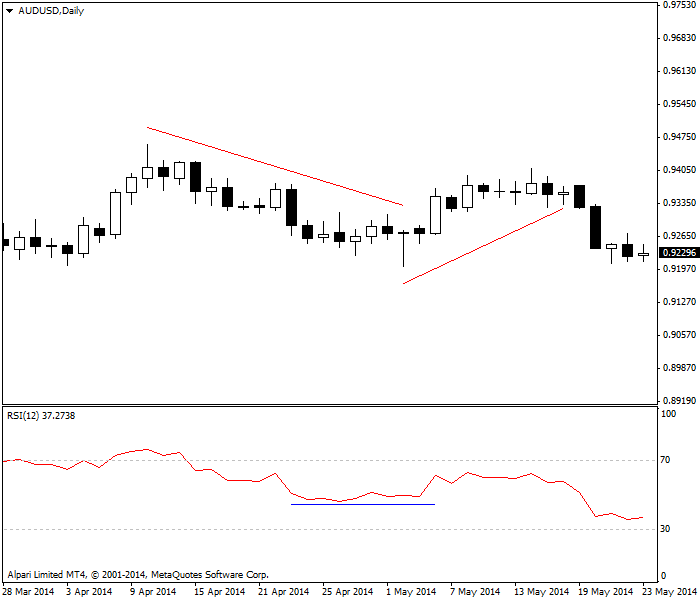 Finally, MACD, which is the most reliable of indicators in Forex, can be seen below. MACD gives a sell signal later than the stochastic. But later, as the price bounces, we get only the most minor of buy signals and it lasts only one period. If you were using MACD, at least the MACD embodying the parameters shown here, you would not participate in the bounce at all. MACD is not providing any tradable signals here. Each of the momentum indicators has its benefits and drawbacks, depending on what kind of trader you are. Fast-traders like the stochastic, errors and all, because it keeps them in the market. If you are more risk averse and prefer to see the bigger picture, MACD will keep you out of a short-lived or false upside bounce like the one shown here. Some analysts consider the MACD a lagging indicator because it bypasses the bounce, but that is a matter of opinion. Bars, bar configurations, and patterns are as good as leading indicators, if not better, as arithmetic-based indicators. A breakout of a support or resistance line tends to be a reliable leading indicator. A number of bars configurations, including candlesticks, have high predictive value, like spinning tops, hammer and hanging man, etc. Other fairly reliable patterns include double top and bottom, gaps, and island reversals. Any indicator based on a moving average is, by definition, lagging. The benefit of lagging indicators is their reliability quotient. By the time you get a moving average crossover using 5 and 10 periods, or 10 and 20 periods, for example, the probability of your trade being in error is quite low. The next chart is showing the 5-period moving average crossover of the 10-period, with the 12-period momentum in the top window. In this instance, the vertical lines mark the crossovers and they happen to coincide exactly with the dates when momentum was signaling buy or sell. Usually momentum leads by a few periods, but never mind — the point is that using a leading indicator together with a lagging indicator is to apply the confirmation principle. Because no indicator is reliable all the time, the confirmation principle is a really good idea, especially if you scale in to the trade using a leading indicator for your first small position and add to it when you have agreement from a lagging indicator. 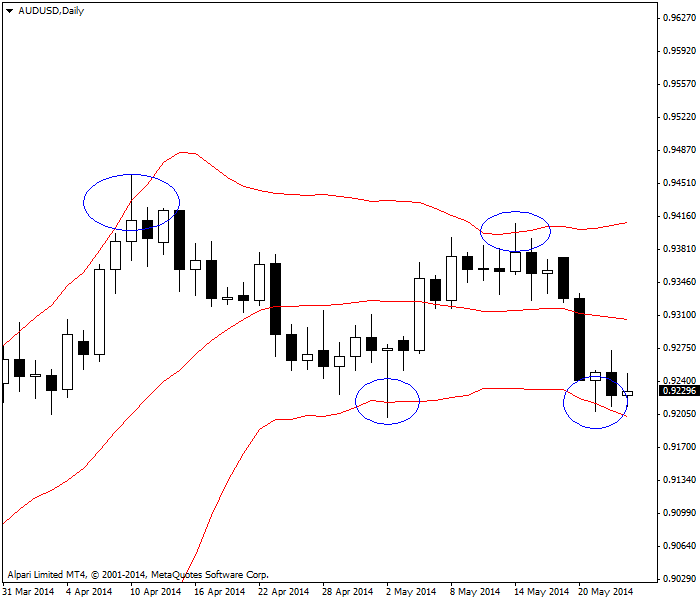 Bollinger bands are based on a moving average and so should be a lagging indicator, but in Forex, they can be either leading, coincident, or lagging. As noted in the lesson on Bollinger bands, when the price breaks the indicator's top or bottom, it is considered a breakout and is likely to be followed by a move in the same direction. Not in Forex. 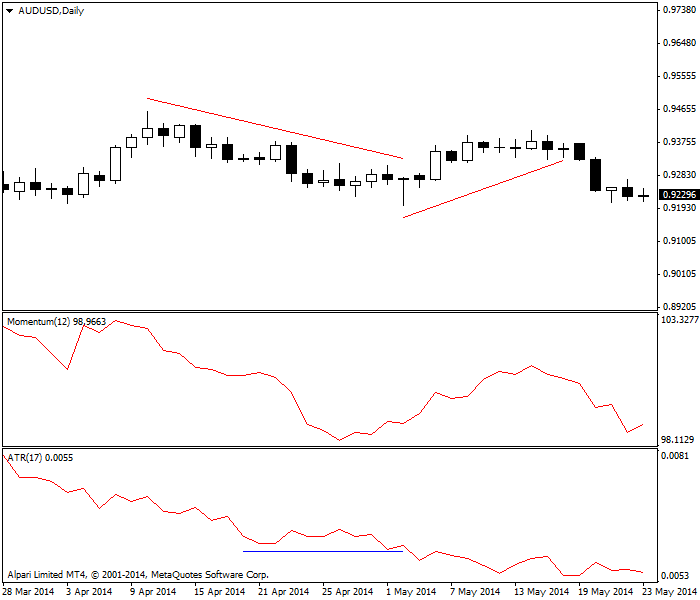 In Forex, we expect the opposite effect — a breakout is followed by a move in the opposite direction. The breakout may last two or three periods (and as many as five) before the reversal, but hardly ever more than that. The final chart shows the same currency pair on the same timeframe, with breakouts of the Bollinger band marked with blue circles. Note that at each of the turning points, the long upper or lower shadow of the candlesticks coincides with the B-band breakouts — a form of confirmation. 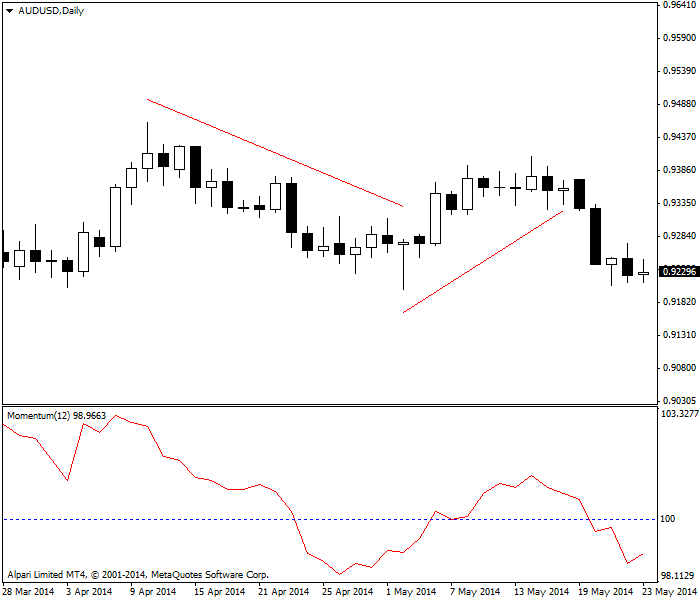 Bollinger bands breakouts signal about reversals. To summarize, the distinction between leading and lagging indicators is not a terribly useful one as long as you acknowledge that momentum will often lead and moving averages will always lag. You can never make a moving average a leading indicator, but the so-called leading indicators will generate a fair number of false (wrong) signals. the trend will likely change.